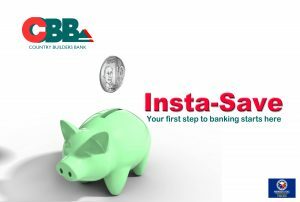 INSTA-SAVE (Basic Savings) | Country Builders Bank Inc.
Country Builders Bank, Inc. (CBB) is introducing the INSTA–SAVE SAVINGS, an interest-bearing account, as its participation to promote financial inclusion. This account is primarily designed for the marginalized sections of society who are considered unserved or underserved by banks, to encourage them to start saving money while building financial knowledge and skills without the burden of having to provide extensive documentary requirements, free from charges and fees or even maintaining a minimum deposit balance. The program is open to all Filipinos, who are eighteen (18) year-old and above especially those who have no current access to basic products and services currently being provided by the Bank. A depositor may open a deposit for himself or herself or jointly with another person. This deposit product will be available in all branches of CBB and will also be extended to residents of nearby city/ies or municipality/ies where there are no CBB branches but within serviceable distance by the branch.